We all remember that time we leveled up our first character, either by using the token or grinding out those quests and we always ended up asking ourselves a question - “How do I get geared?” We did not all have the money at one time with the terrible prices of crafted armor too much for our newbie wallets! Luckily for us, we always had Katarn armor! So, today I will be talking about the wonderful set that we all came to know and love, as well as how to obtain your own set. The canonic look of the Katarm armor. 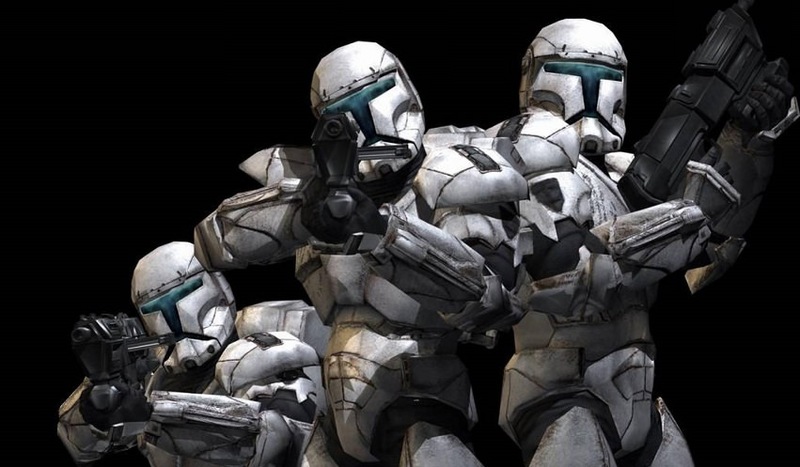 Katarn-class Commando armor was developed and used by the Clone Commandos during Clone Wars. It can be first seen worn by troops during the Battle of Geonosis but it was utilized more prominently during the Kashyyyk campaign. In fact, it’s named after the reptomammals native to the planet, Katarns, often used by the Wookiees as mounts! The armor itself featured a helmet with HUD that consistently displayed various tactical data, which was fitted with communication antennae and even had special sensors. The body of the armor was very resistant to cold and heat and could be sealed so that commando wearing it could survive in vacuum for 20 minutes. The knuckle was outfitted with a retractable vibroblade. Even the backpack had special features, such as extra oxygen tanks, bacta dispenser and even external communication array. While it was more expensive and in some ways had restricted mobility it provided a better protection, largely due to the composition and novel chemical properties, as well as deflector shields. It was an updated and more specialized version of the famous Phase II Clone Trooper armor. This bad boy was quite heavy, weighting 20 kilograms (Approx 44 pounds), and was sold for nearly 100’000 credits on the black market. Luckily, there is a quest we can do to obtain it for free. The set of quests “Avenging Mort”, among the community known as “The Katarn Quest”, starts on Dearic, Talus, where you can find the quest giver himself. The Fett clone served as a Commando, but following a betrayal by his commanding officer and a period of brutal experimentation, can now be seen drinking his days away. Buy him a drink to start the quest. Mort can be found at the bar in Dearic, and is not hard to miss. Before you start the quest, make sure you have 11 top-level inventory slots open, otherwise you risk not receiving the reward. If you are a new player, I suggest grabbing friend with you, as it involves fighting. If you are undergeared, you will not have the best of times. I will not be getting into the walk-through of the quest itself, since it’s recommended you experience it on your own. If you do however prefer to use a guide, it’s readily available right here. Near the end of the quest you'll see the second thing this quest is famous for- you will get to meet the “leader” of your faction. The armor itself has decent stats, and is especially irreplaceable when you are a new player just getting into the end-game content. All pieces have identical stats, and offer 5664 resists to all forms of damage. The best part about this armor is that it can be worn by anyone, provided they have the authorization to do so. It can even be traded between alts and other players. So if you have a friend and you yourself are already geared, you can part with the set. The armor comes in three variations, depending on your faction when you the quest. 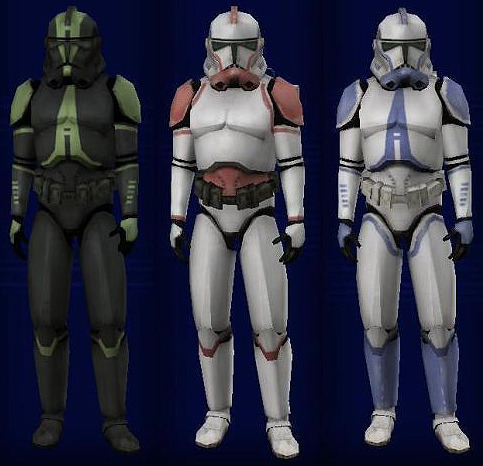 Three models of the Galaxies-type Katarn Armor are available, the Mark-II (Neutral, white with blue markings), the Mark-IV (Rebel, white with red markings) and Mark-VII (Imperial, black with green markings). **UPDATED** Special thanks to Napyet for the generous video guide on Katarn armor! You can view it here ! I hope this Friday Feature was informative to you! Last edited by Laviz; 03-15-2019 at 04:34 PM. Any idea why mine is Black with Orange stripes? any idea if similar armor will be added in the future? or is in the pipeline to be done up already?